-- Explains GASP of Colorado's mission and goals and why GASP needs your support to sustain programs to advocate for your right to breathe smoke-free air at work, in public places, and in multi-unit housing. Smoke-Free Postcard and Sign #1 - Gorgeous 4 x 6 sign or a postcard developed by graphic designer Linda Parks and created for GASP. 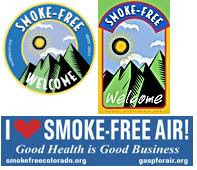 I Love Smoke-Free Air Bumper Sticker - Show your support for the Colorado Clean Indoor Air Act and smoke-free policies. Most items can be downloaded by downloading the image. The first four items are available by mail to US addresses only. NOTE: Your donation to cover postage and printing costs is appreciated. If you need an email address (or lots of addresses!) you can go to mail.com and create another one just for signing up for freebies.